It's believed the reptile ingested either a plastic bag or another plastic item thinking it was a natural food sources. 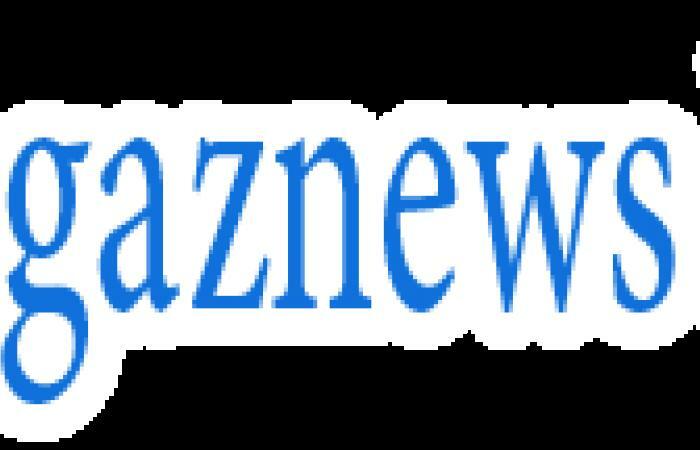 Veterinary surgeons had to manually unclog the animal's nostrils and give it antibiotics for the infection, believed to have been caused by consuming the plastic. 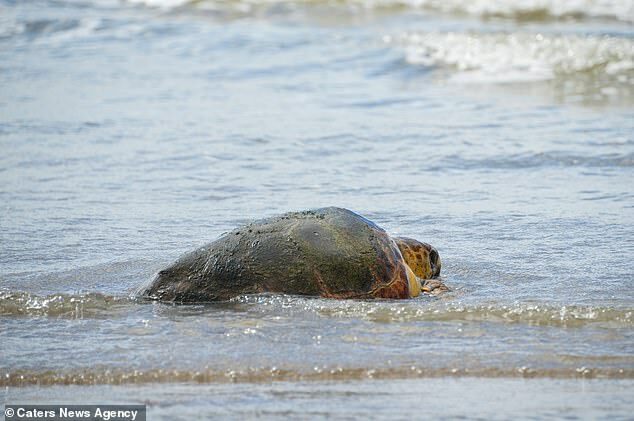 The second turtle who was rescued at the same time was found to be healthy after undergoing clinical observation and analysing its blood samples and faecal matter. Without the treatment, the animal would have died due to the severity of the infection and made it easier for other sea creatures to prey on it. The foundation is warning about how plastic consumption and disposal is destroying the sea's ecosystem. 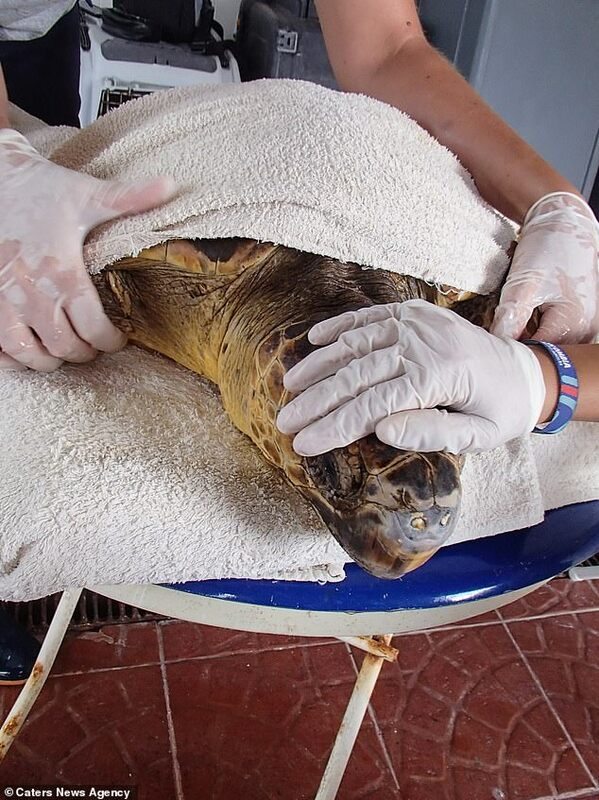 Hiram Toro, 37, operational coordinator of the veterinary team said: 'At the time of admission, one of the turtles defecated nylon, a type of plastic that usually appears in supermarket bags. 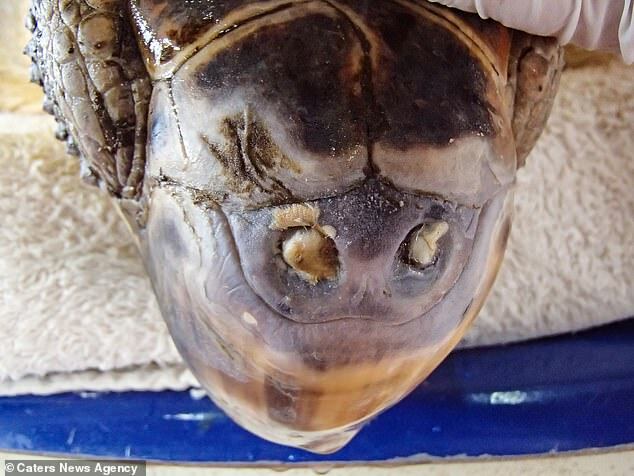 'In addition, the turtle that defecated nylon and presented an infection in its nostrils. 'We were able, through radiographs, to determine that the infection was exclusively in that area, since our main concern was that the infection had spread to their lungs. The vets gave him an intramuscular antibiotic and manually extracted the abscess that blocked his nasal passages.